Stars have fascinated scholars and common men alike since the first pair of eyes gazed into the night sky. Some looked to them for power, others for answers, and others for sheer wonder, but time and again, the eyes returned skyward to gaze at the twinkling points of light. As the centuries passed, each race began assigning names and shapes to the patterns in the night. 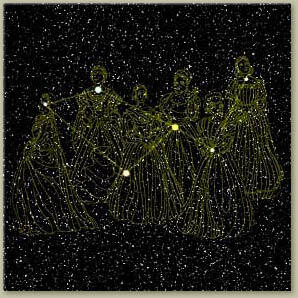 Many constellations differed wildly from society to society, but as the cultures began to interact, some of the star shapes came to agree. The following is a list of the best-known constellations common to most societies in the known world, listed by season. Images and astrological interpretations have been provided by Sister Lemandria D'Verethin. 6 stars The Handmaidens are Zelia's ladies-in-waiting. They sit, clustered tightly about each other in the night, looking down at the world and giggling insanely. Persons born under the influence of the Handmaidens tend to be scattered, suffering from a lack of attention span. They also tend to be tremendously creative and energetic, and laugh easily. Some older tomes imply such persons are doomed to bouts of erratic behavior, but the Sisterhood's research has not found this to be universally true. The Handmaiden's influence is subtle, incorporating both genius and madness, creative energy and hysteria. 5 stars Depicted by five stars in the shape of a T, the Hammer is said to be Eonak's. Some say that, on clear nights, you can hear each ringing strike as the Master of the Forge works gleaming veil iron into the stars themselves. Those whose birth is influenced by the Hammer embody strength and perseverance. They are steadfast in the performance of their duties and very reliable, and can be counted on to perform under pressure. However, they can be shy or reserved around other people, and do not enjoy the spotlight. Quiet effort and steady progress towards their goals are their primary traits, their faults lie in stubbornness and dogmatism. 11 stars Andelas has made his mark on the night sky with the Cat's Paw. 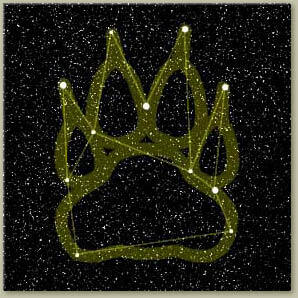 Eleven stars form the paw and claws of a giant feline. Persons influenced by the Paw are quick and powerful, they revel in the hunt and the stalking of their prey. They are sly and quiet, eyes ever watchful for opportunity, but can sometimes be considered sleepy or lazy by those who underestimate them. They rarely misstep, and are cautious people, although their self focus can be disturbing to others. They have little pity for opponents, in some cases to the point of cruelty, but are lovingly devoted to those who have earned their respect. 9 stars Nine stars form the leaf, stalk, and petals of Oleani's flower in the brilliant spring sky. The Mistress of Adoration watches over the spring courtships and lovers laying together to watch the scintillating stars in each other's arms. 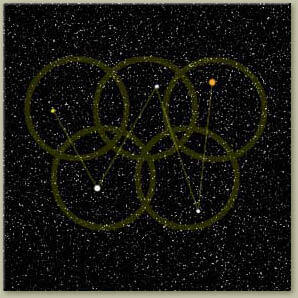 Oleani's constellation influences people to be warm, loving, and caring. They are romantics and dreamers, often to the point of making poor personal choices in their quest for love. 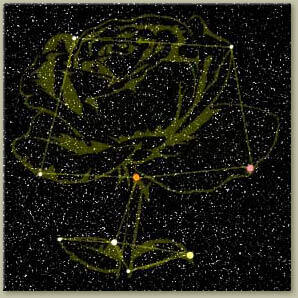 Love is blind, and the major fault of those influenced by this constellation is allowing themselves to give too much, and to always think the best of others even when such faith is not warranted. 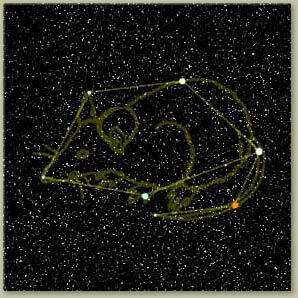 7 stars Three stars form the tail of this celestial rodent as he hunts lunar cheese through the night. Those influenced by the Rat are adventurous and energetic, dynamic and quick-witted. Like the rat, they survive and thrive in conditions others would find rocky. Their faults lie in being selfish and avaricious, sometimes quick-tempered, and they can often be impulsive or impatient. 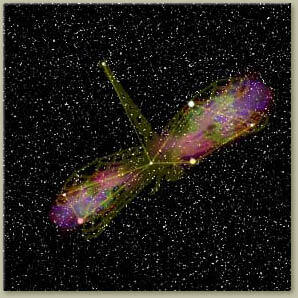 7 stars Twin nebulae ripple through the wings of the Dragonfly, adding an iridescent quality to the nocturnal insect. The Dragonfly is beauty, and those affected by her influence are artistic and creative, usually graceful and well mannered. However, they often place too much stock in appearances, some might call them vain. Beauty in others can produce either adoration or worship, or jealousy and disdain. Frequently those individuals most strongly affected by the dragonfly can be flighty, possessing little forethought and short attention spans. 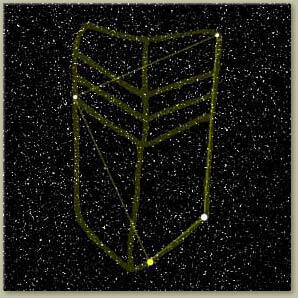 21 stars The First represents the First Drake, Ka'lethas. His body was covered in silver scales that shone like the stars, and a mane of deep indigo framed his face, represented by a faintly visible purple nebula in the head of the constellation. The First winds his serpentine way through the middle of the summer sky. The First generates the traits of power, ferocity, mystery and magnetism in those he influences. Other people tend to find them fascinating and charismatic. But the darker side exists as well, these persons can be cold, aloof, rejective of perceived weakness in others. Their standards are high, often impossibly so, and perfectionism is a common trait. 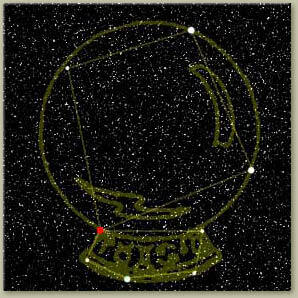 8 stars This constellation resembles the scrying ball in which legend says Jastev foresees the fate of the world. There are four stars in the ball itself, and four stars in the base. Jastev's Crystal has strongest influence on mystics and seers, and those whose perceptive powers are strong. They peer into mystery and seek to discover all that is hidden, though it is said that those who learn to much are rarely happy. Those influenced by the crystal can be bright and creative, or moodily somber. Emotionally stormy, those influenced by the crystal experience joyous heights and terrible depressions. 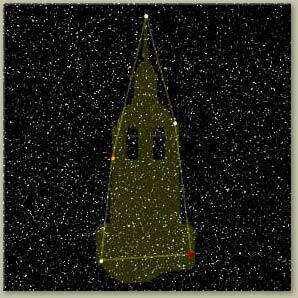 1 star The Huntress' constellation is made up of a single star, called Krrska. 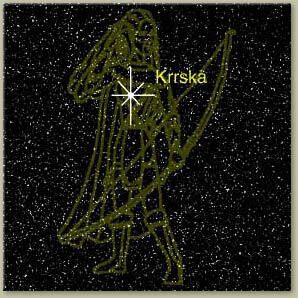 Ancient stories hold that, as the Huntress died after exacting revenge upon her Queen and Arachne, the gods raised her to become the star Krrska. 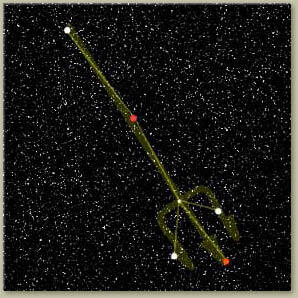 This star is held as remarkable by all astronomers, as it constantly shines with a brightness that surpasses all other heavenly bodies, and it always has exactly eight points. Those influenced by the Huntress' star are optimistic and freedom loving. They tend to be jovial and good-humored, often philosophical. However, they also have a tendency to be somewhat irresponsible, preferring freedom to duty. Their nature is restless, and their dealings with other people somewhat uncomfortable, some say that they lack tact. 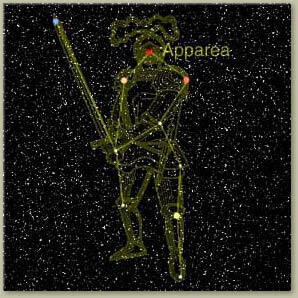 10 stars The Guardian is always just behind the constellation of The Huntress, guarding her back as she travels across the sky as he guarded her in life. 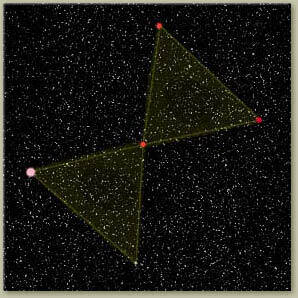 The "head" star is Apparea, with the other nine falling loosely into the shape of a man. Those influenced by the Guardian are the very soul of honor and duty. They are brave and trustworthy, and give of themselves to benefit and protect others. However, this also can lead to intractability, and they are often stiff-necked and overly demanding of others. Like a bulldog, they can cling to their cause tenaciously, right or wrong they choose and stick by their decisions. 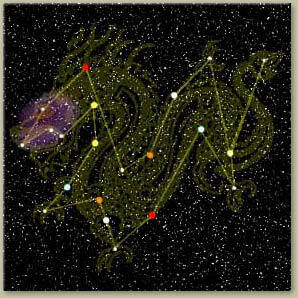 4 stars The Sun God is Phoen's constellation, the nighttime reminder of his soverign reign over summer. It is shaped like a wide sunburst. 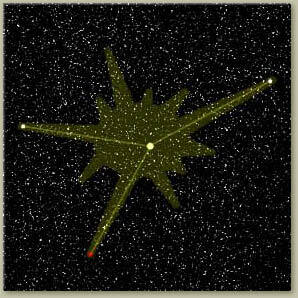 The star burst is warmth and light, and those influenced by it are reverent and strong in their support of life, love, happiness. They are nurturing, and make excellent parents. But the darker side of the Sun God is egotism, and the use of power too quickly and with lack of forethought. Often their strong responses to most situations are considered overboard, and their eagerness can cause more harm than good. 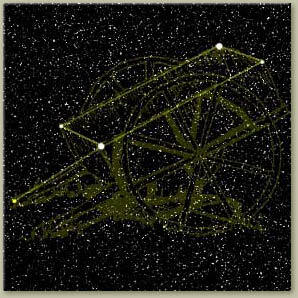 5 stars With four stars as the wagon's body and one as its yoke, the Wagon celebrates the traders and merchants that travel the land in the summer, pulling their carts of wares to sell. People influenced by the Wagon tend to wander the world, rarely staying in one place for long. They can be open and encouraging, and love to meet new people and see new things. However, there is a hint of greed and acquisitiveness, and their wandering natures make them poor choices for friends or mates, except with like-minded people. They are meticulous in their planning, and can often overwork themselves. 5 stars With five stars patterned like a W to represent each ring in her symbol, the Queen of Enlightenment is said to watch over Elanthia, gathering knowledge with its five shimmering eyes to pass on to Lumnis. Those influenced by the Queen are seekers of knowledge and researchers. The tend to be good councilors, wise in their decisions and fair in their dealings, offering guidance and wisdom. However, they can also be bookish, awkward around other people, and pedantic in clinging to beliefs. 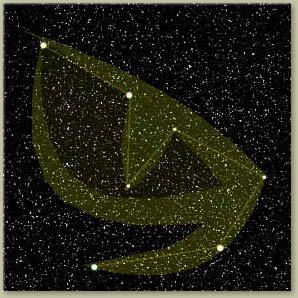 6 stars Charl's symbol presides over the autumn sky, and over the stormy seas of the fall. There is one star for each of the tines, one for the base, and two for the handle. Many a shipwrecked sailor has glanced up from the remains of his ship and cursed the Trident, blaming Charl's influence for his predicament. The Trident embodies storms, mercurial and violent. Persons influenced by this constellation tend to be very warlike, pugnacious, often spoiling for a fight. But like the ever changing seas, their moods are fickle, they have greater depths than what is seen on the surface. It is said that soon or late the seas wash up all manner of things on the shore, and those the trident's wyrd will surprise you with the treasures they bring to the surface at odd moments. 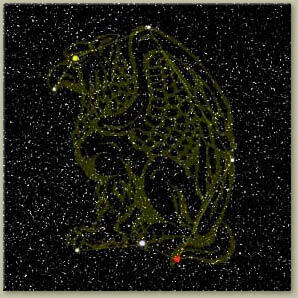 7 stars The Bringer of Terror holds his place in the night, inspiring nightmares with his jackal head constellation. Some say that each star represents a different kind of nightmare, leading to the ultimate insanity of the stargazer. It is said that the Jackal brings only nightmares, but as all constellations it is not wise to underestimate him. The power of dreams is also the power of ambition and aspiration, and persons under the Jackal's eye seem to achieve positions of power and responsibility (and yes, great wealth) with ease. Oft enough your dreams once achieved will not turn out precisely as you'd hoped, and the unreal nature of dreams must lead you to wonder if your prettiest dreams may somehow turn to horrors...or perhaps great joy. Fate is a strong variable in the Jackal's realm. 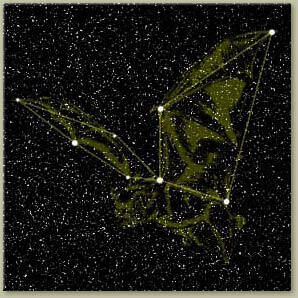 7 stars One of Elanthia's treasured intelligent, magical, and seldom-seen creatures, a rampant gryphon holds a special place in the night sky. The seven stars represent each leg, the tail, the beak, and one glimmering eye. The Gryphon's dual nature is reflected in those under his sway. Generous and warmhearted, enthusiastic, broad-minded and expansive are they. And yet...at the same time we see reflections, pompous and patronizing, bossy, intolerant. Their dichotomous nature makes them dangerous to others in love or business, yet their large hearts make these maddening individuals hard to resist. 6 stars Represented by six stars of a curiously golden color, Imaera, Goddess of the Autumn, watches over the night with her stellar stalk of wheat. 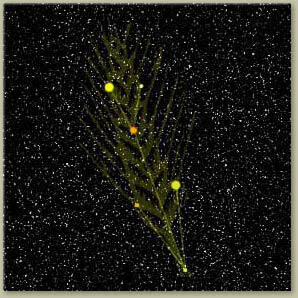 Two stars form the main stalk, while two stars on each side make up the kernels of grain. To be touched by Imaera's wheat is to be healed, and in many ways those possessed by the Lady of the Green are whole and hearty people. Their lives tend to be serene and calm, and without fanfare they bring peace and healing to troubled hearts around them. Yet the Lady is also the touch of autumn, where good things begin to fade slowly away; and these peaceful souls can sometimes wither and twist into something unhealthy, instead spreading corruption where once they healed. 8 stars With four stars per scalloped wing, the evening flyer also glides through the autumn welkin. The Bat is quick and silent, and those he influences are quick of wit and quiet of nature. Their jokes are uncommon, but sharp and poignant when given, and the bat can at times fly joyously and with great skill. But the way of the bat is also dark and eerie, some of those he influences may turn dangerous, uncommunicative, malicious. 4 stars Guarding the cold winter nights from the colder touch of Undeath, Voln's four star shield protects the heavens from Luukos' corrupting fingers. The Paladin is nobility, shielding the innocent from injustice and holding fast and true to the ones he loves and cares for. His arm is strong, but rarely in an unjust cause. However, the cause is not always worthy, and those the Paladin controls may find themselves tilting at windmills. Whatever the cause or goal, it is always given a whole-hearted effort, even to the point of self-destruction. 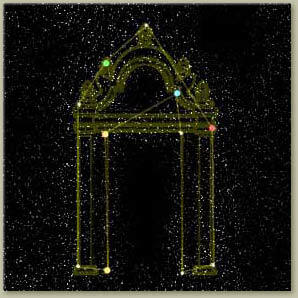 11 stars Glimmering in the ebon sky, eleven stars form the outline of Lorminstra's gates. Beyond them is darkness, and perhaps more. The gates show the way to Winter's realm, as passing begins from what was to what is to come. Those influenced by the gate are mindful of fate and what lies ahead, and tend to live for the moment, enjoying the gifts of life while they last, reveling in today. If they are given to fault, it lies in too much introspection and self-examination, and at times a lethargic what-does-it-matter attitude. 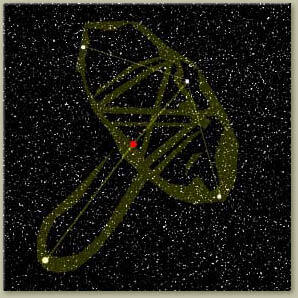 7 stars As Lumnis has a constellation, Fash'lo'nae can hardly be outdone, seeking to know and enlighten. His slit-pupilled eye watches from high above the planet, formed by seven twinkling stars. To be influenced by the Grandfather is to be a seeker, almost monomaniacal in pursuit of personal goals, power, knowledge, wealth. So strong is the quest that others hardly matter, and little time is taken to relax. Ambition is a driving force, as is discovery. But like the Grandfather, not all is evil, those touched by the Eye make great discoveries, and often are of great benefit to society around them. Only the record of history can say if the greatness achieved is worth the price that was paid. 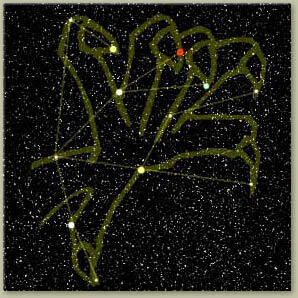 12 stars Twelve stars make up the distinctive six-fingered talon commonly attributed to the Ur-Daemons. Oral tradition holds that the final Ur-Daemon to walk Elanthia was not driven back through the tear in the Veil, but was destroyed in a brilliant explosion, sending his hand into the heavens to remind god and mortal alike of the dangers beyond. The First represents power, but the Ur-Daemon represents destruction. Those guided by the talons cannot seem to help themselves, they always hurt those around them as they pursue their own goals. And yet there is some good to them as well, they are determined, passionate, often intuitive and magnetic. They can be very great leaders, but if the men they lead go to glory or death is usually unclear. 5 stars Five oddly red stars shine in the winter sky, forming the pattern of an hourglass. 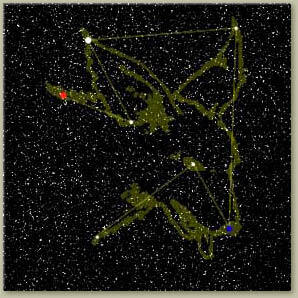 This is the constellation Arachne, giving us the view of the spider's belly marking as if she hovered over the world, ready to eat us all. Arachne's hourglass represents time, and the forces implicit in history. Good or ill, time touches each of us, and those under Arachne's influence seem to have much impact on the world around them. Their good points can be adaptability, versatility, eloquence, liveliness. But we can also see in them nervousness, superficiality, inconsistency, and sometimes acid cruelty. 4 stars One of the most brilliant stars in the sky sits at the tip of the Unicorn's horn, guiding Ronan's steed through the darkened sky. 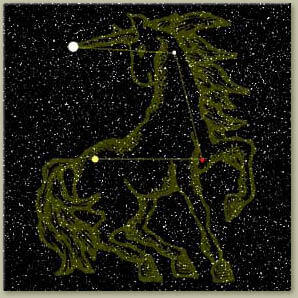 The other three stars represent key points along the body, leaving the Unicorn a subtle but powerful symbol. The Unicorn is the most unworldly of beasts, capricious, elusive; and many touched by these stars have those same qualities. Imaginative, sensitive, compassionate, kind, sympathetic. Untamed is the Unicorn, however, and the dark side can be escapism, idealism, secretiveness, an unwillingness to commit to others. 5 stars Rising through the night sky, some legends say that the Spire is where Lumnis goes to think and Fash'lo'nae goes to study. The spire is a solid foundation, and those guided by this force tend to value family, conformity, finding their place in the world and holding it. They are almost the opposites those guided by the Wagon, they never stray far from hearth and home. Their critics would call the stolid, pastoral, even rustic. But the Spire is anchored in bedrock, those who follow it always persevere and stand the test of time. This page was last modified on 3 December 2015, at 19:22.